Chad Campbell, above, was recognized for his Pro eliminator victory at the Summit E.T. Finals during the NHRA Division 6 Banquet. The gala event was staged at the Marriott Hotel near the SeaTac Airport in Seattle. Campbell was the recipient of a special NHRA Wally trophy. 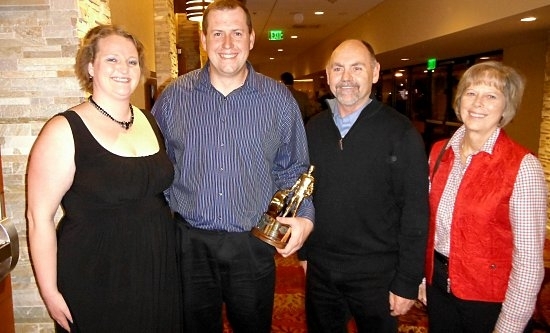 He was joined at the banquet by Firebird’s Misty Kramer, Dennis & Karen Law, and Scott New. Northwest Division track meetings were also conducted over the course of two days by new Division 6 Director Matt Levonas and Vice President-Racing Administration Josh Peterson. In addition, training was offered by Division 6 Tech Consultant Dave Schaffel as part of the SFI Certification Seminar. The New Crew and Firebird was also proud to accept the plaque for the NHRA Division 6 Media Award, which was presented on behalf of National Dragster (and signed by editor Phil Burgess). One of the highlights of the evening was the Hall of Fame induction of the “Northwind” AA/Fuel Dragster team. Jim “Rock” Rockstad, an original member of the race team (which included Ed “the Ace” McCulloch, Jack Coonrod, Earl Floyd and Jim Albrich) accepted a NHRA Wally trophy to commemorate nearly 50 years of involvement in the sport. In addition, Rockstad was once the track operator at both Seattle Int’l Raceway and Portland Int’l Raceway.